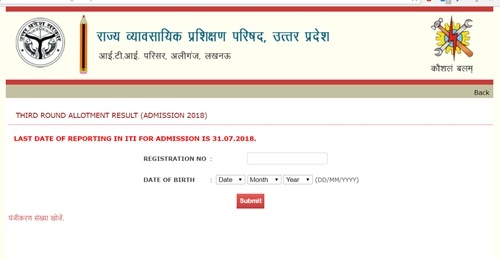 UP ITI 3rd Merit List,Cutoff Marks & Third Round Counselling Seat Allotment Results 2018 released on july 26th: Vyavasayik Pareeksha Parishad Uttar Pradesh, Lucknow has released the ITI merit list for admission into Government and Private colleges. Candidates applied for Industrial Training Institute (ITI) courses in the state of Uttar Pradesh can check the UP ITI Merit List from the official portal, vppup.in. Candidates shortlisted in the merit list will have to appear for the counseling and document verification process. The UP ITI Counselling schedule and counseling process will be listed clearly on VPPUP Website. Candidates shortlisted in UP ITI Merit List can check their names and further proceedings by visiting the VPP UP official portal. The UP ITI Cutoff marks merit list, detailed counseling process and more details furnished here. Candidates can go through this article for more information. Vyavasayik Pareeksha Parishad, Uttar Pradesh, Lucknow annually offers admission into Industrial Training Certificate courses for eligible aspirants. In the state of Uttar Pradesh, there is 5 state-level ITI colleges in the capital and 70 Private ITI colleges in the capital were affiliated to VPPUP. And 305 state ITI institutions and 3000 private institutions offer the ITI course. This year 14 new institutes will be opened by the UP-state government. Overall, there will be 1.16 lakh seats will be available for admission into ITI courses in the state of Uttar Pradesh. Note: LAST DATE OF REPORTING IN ITI FOR ADMISSION IS 31.07.2018. Candidates belong to various categories such as General, BC, SC, CT, Ph.D. etc will get the reservation in admission process as per the norms. The reservation criteria are mentioned here for the understanding of aspirants. 15 % seats will be reserved for OBC Trainee. Note: All Candidates will get admission into all trades as per their preference. Applicants will be offered admission into Group A & B Courses, Engineering & Non-Engineering Courses with Technical & Non-Technical Courses. Candidates can Choose Maximum 10 Courses in 6 Institutes according to their Educational Qualification. UP VPP is going to release the merit list for Group A, Group B Courses separately based on the essential qualification and preference of marks. The VPPUP has introduced new rules, as such the preference will be given for state candidates in the admission process. Vertical & Horizontal Reservation will be provided based on 25% seats based on Block Level, Tehsil, District Level & State Level. The number of Seats will be available Online based on the Pool Arrangements. As per the new rules, the first preference will be given for NCVT courses. When comes to the choice filling scenario, students can opt maximum 6 Choice in any 3 Districts. Applicants can select maximum 10 Choice for Group A & Group B Courses. The UP VPP will prepare the district-wise merit list for Group A, and Group B Courses individually. Once the seat allotted in Group A courses, then the candidate will not be revised for allocation in Group B Courses. In admission process, 20% of reservation for female candidates will be offered. There are 12 special ITI Colleges were there in UP exclusively for female candidates. The UP ITI 1st round seat allotment will be done on various factors such as Trade, Institute, Course & Group wise Seats. If a candidate specified in merit list does not get the admission in the 1st round, they can proceed for next rounds of seat allocation process. The VPPUP is going to prepare a separate list with the number of seats left in the 1st round of seat allotment process. The 2nd round of seat allocation will be done for the remaining seats. If students got the seat in the 1st round and waiting to get admission in other college/institute can also participate in the 2nd round of seat allotment process. The VPPUP will display the 2nd list on its website and also the information will be intimated to registered candidates through phone, email. Candidates in the merit list can get admission within 60 days. Coming to the Upgradation, candidates who got the seat in the 1st round and wants to upgrade the seat can again select their preferable course/institute, trade and need to continue with the 2nd round seat allocation process. If they get admission, they have to pay the requisite application fee or they may proceed for next round of seat allocation process. The rest of the seats will be allocated in the 3rd round of admission process. The candidates will be called for 4 times and the admission process will be completed within 5 days based on the remaining seats. The VPPUP is going to display the complete information such as choice filling, available seats and other details on its official portal, vppup.in. If the student has not provided with the option, then he/she will be given admission into the college/institute filled on the admission form. Overall the selection process will be completed within 4 days and the candidates will be given 5 days for admission. The 4th round admission process will be done based on the remaining seats. The admission process will be done within 07 days. The VPPUP will list the information of candidates who had already applied earlier. Candidates those have newly applied will have to attend for document verification from the Principal of Optioned Institute within 3 Days. The VPPUP ITI admission process will be completed within 4 days and the candidates have to report to the admission within 5 days. Contact for Direct Admission in Lucknow Private ITI With Trade Fitter/Electrician of NCVT.